Designed for the time-crunched cyclist, Pro Power Endurance Coaching isyour partner in developing plans to get the most out of your time. We make it simple to make the most of your time, and achieve maximum results. Check out some of the results and testimonials of some of our coached athletes, and learn what Pro Power Endurance Coaching has meant for them. 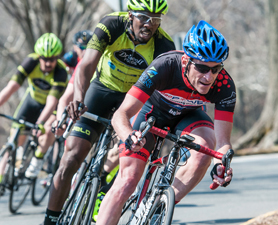 ProPower Endurance Sports Coaching is a cycling coaching service located in northern NJ. We specialize in providing individualized training programs for cyclists in NJ (New Jersey) and surrounding areas. Services include training plans, athlete assessment, athlete testing, one-on-one training and other related services. Take your game to the next level, with NJ cycling coaching programs from ProPower. ProPower Endurance Sports Coaching provides professional cycling coaching services. Our focus is on individualized training programs for cyclists in the New Jersey (NJ) area. Services include custom training plans, athlete assessment, athlete testing, one-on-one training and other related services. ProPower coach Larry Towner is a USA Cycling certified coach. His cycling career has spanned 4 decades. From a nationally ranked junior to elite Cat 1 road and track to expert MTB to elite masters racer he has developed an extensive knowledge of training theory along with the tactical and mental side of racing. Contact ProPower today and let us provide you with the tools to bring your performance to the next level! We offer the following training programs.